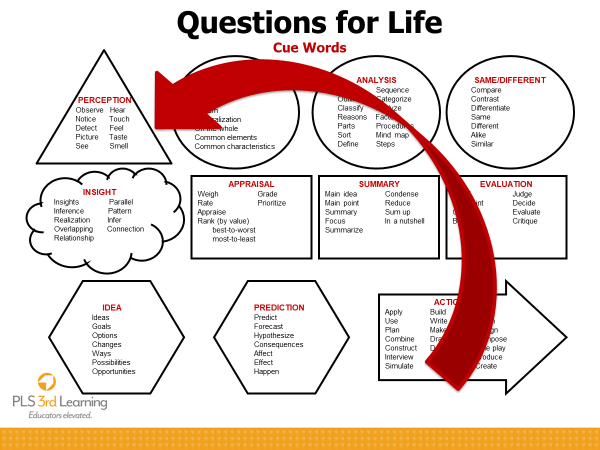 I was recently asked to create an illustration using the Questions for Life format in planning questions that guide students’ critical thinking. You might find this example helpful when working with a PLC that is planning instruction or when coaching an individual teacher. 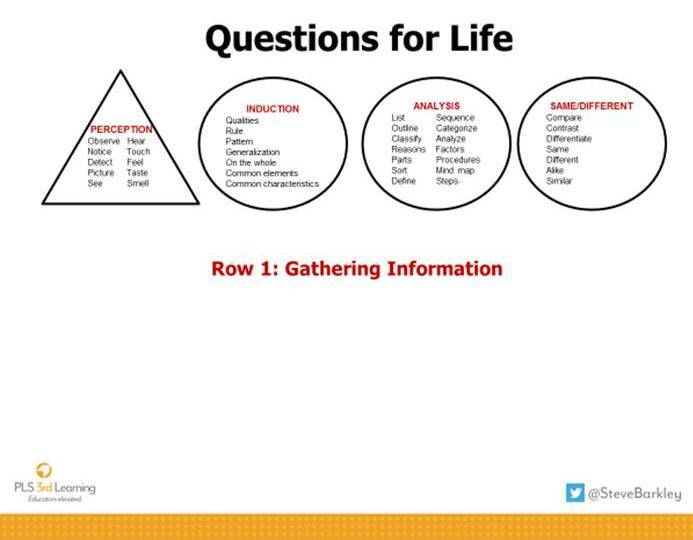 The Questions for Life book and introduction video can be found here and the cue words for each of the 11 question types here. Perception – Literal sensory information: what do you see, her, feel, smell, taste? Induction – Finding patterns, generalizations and conclusions from instances and experiences. Analysis – Categorizing, sorting, and mind-mapping information. Same/Different – Comparing instances and perceptions: supports induction and analysis. 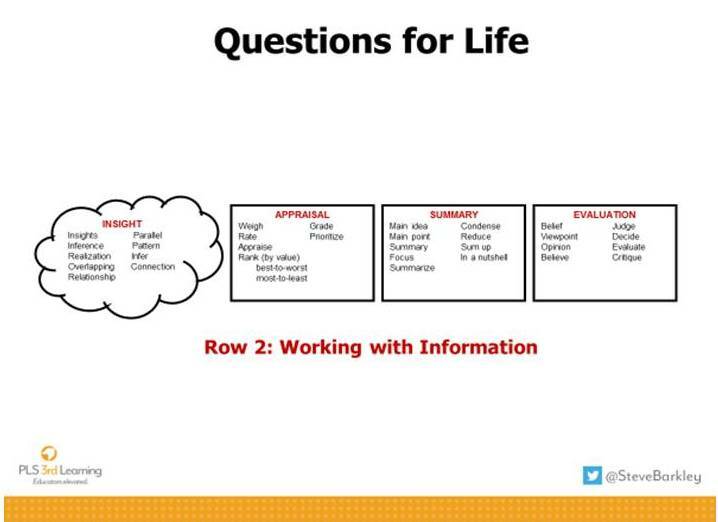 The second row of questions are used to “work with information” that is available and has been gathered from row one thinking. Insight – (Induction to the second power.) Generalizations connect to uncover overlapping patterns and relationships. Appraisal – Rank and prioritize the information. Summary – Condense information: “in a nutshell’ or “on the whole”. Evaluation – Beliefs, opinions, and/or judgement. 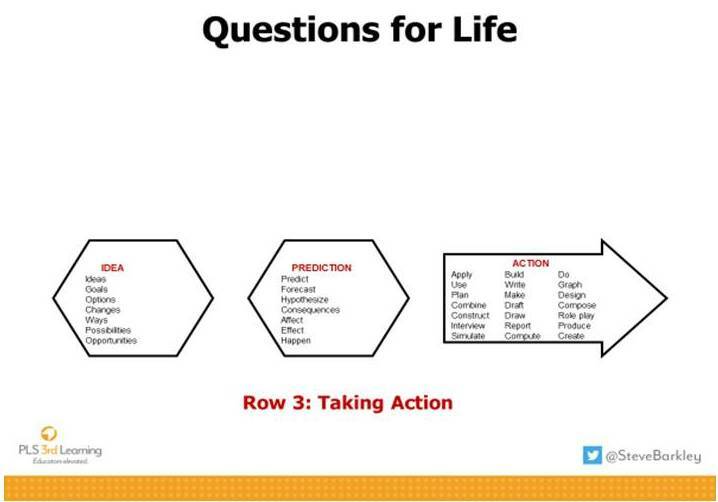 The questions in row three, guide thinking to action. Ideas – Generate options, changes, or possibilities. Prediction – Explore the positive and negative consequences of an idea. Action – Implement the idea. After a study of man’s impact on nature in their community, students decided they wanted to generate a local community event to raise funds to restore a local waterfall area. Our goal in using questions to guide students’ critical thinking is to create opportunities for students to learn to create questions that will empower them as critical thinkers and problem-solvers.